The Teddy Bear Parade is one of Oregon City's signature events. It’s a one-hour processional over a 1.10 mile route. 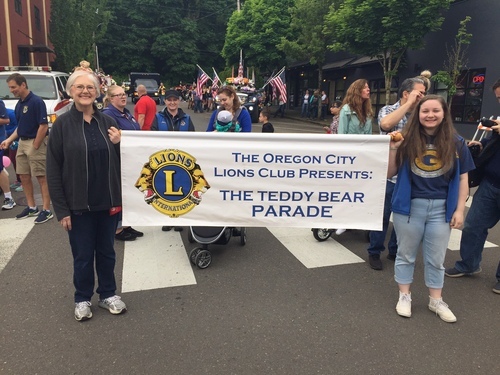 The Teddy Bear Parade has been a community highlight for Oregon City and Clackamas County for the past 22 years. The Teddy Bear Parade gathers NEW teddy bears and stuffed animals that are given to law enforcement agencies, fire departments, emergency rooms, children’s hospitals and women’s shelters in Clackamas County. These stuffed animals are then distributed to children throughout our community who need comfort in times of crisis. The parade is also a time for us to honor our emergency personnel who protect the entire community. Please have your group plan to meet you at your assigned staging area. A staging manager will be available to direct individuals to your location if they are lost. Assign ONE representative of your group to check-in at the check-in booth at 10th and Main Street.